Kwese promised a while back that they would be adding some more channels before the end of the year. True to that promise, four new premium channels have been added today, the 20th of December. Earlier in October Kwese announced a deal with VICE Media which should see more local content come to Kwese. It seems the folks at Kwese have been busy trying to spruce up their offering. Most will be excited to see FOX added because on that channel are some popular series. Empire, the favourite of many can be viewed on this channel. I am not really a fan of that particular show but one of my all time favourites, The Simpsons are there too as is another good one in Futurama. Even as I write this I have actually put a reminder for the Simpsons episode scheduled for 9 pm this evening. Life’s good my guy. Atlanta is there also if you haven’t watched that magnificent first season yet. Too bad we might have to wait a few years to get season 2. You might want to tune in to watch The People V OJ Simpson is one other exceptional series you might want to watch if you haven’t yet. Other good shows like Law & Order, The X-Files and NYPD Blue are available on FOX Africa. 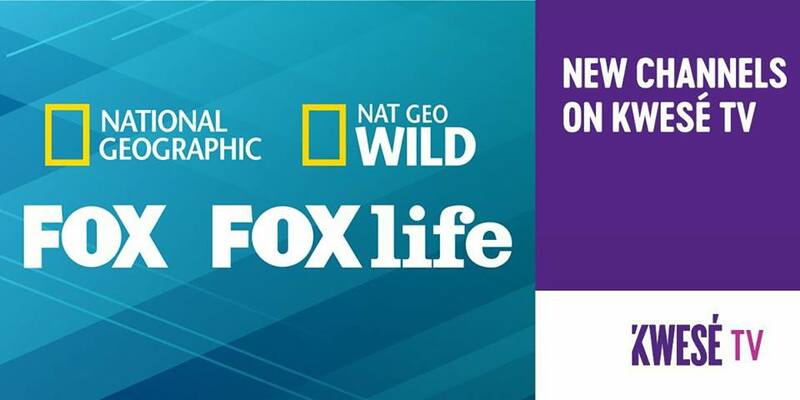 Personally I am excited being the Nat Geo fan that I am that both of the Nat Geo channels have been added. I follow the animal stuff and the interesting shows like The Science Of Stupid and The Numbers Game on Nat Geo. To the sport fans, there’s no word yet on when we will get the football. Just had to clear that up before you ask. What do you think about all this? Are these channels enough to make you consider making the switch from whoever you get your entertainment currently? If not now, Kwese will be adding more channels in the future and so you might have options as well if your favourites are added too. I hope DStv is working on bringing us even more awesome stuff. They have had all the channels that have just been added by Kwese for a while. DStv also regularly adds new channels but with the new competition from Kwese I think they will be working even harder to maintain their lead. That is a win win for us consumers. Can you PLEASE add the DMX Music channels, and other audio and Radio stations. This will be greatly appreciated by audio music lovers of a diversity of genres, AND ESPECIALLY, by those with visual disabilities/impairments who mostly want to listen as opposed to watching which they cannot do. While done techzim. You have a new fan. Thanks for the updates. Plz Kwese we want football Epl . This definitely is a step in the right direction Kwese. I hope next you are working on getting BBC channels and ITV and then I for one will stop moaning and missing DSTV. The best thing DSTV could do is make the payments possible! Great news. Having more EPL matches will be the cherry on top! kwese Tv try to bring Ssport EPL Laliga and also so many channels .